CATAC - the Clinical Academics in Training Annual Conference - is a unique cross specialty event designed to bring clinical academic trainees together to present their work, meet one another and network with senior researchers. What was previously the Spring Meeting, CATAC is the result of the evolution of the prestigious meeting following an independent evaluation, and the most recent event was held at the Royal College of Physicians, Edinburgh on 8 November 2018. We will announce the date for the next Clinical Academics in Training Annual Conference in 2019, please subscribe to our newsletter to receive updates. Are you a clinical academic trainee looking for a chance to present your research, perhaps for the first time? Meet with your peers and senior academics to build networks. The keynote speakers gave honest accounts of the career ups and downs of a clinical academic, and invaluable advice on remaining true to yourself, maintaining work-life balance and how to ultimately succeed as an independent researcher. There were interesting presentations covering a diverse range of academic disciplines. We left the meeting with broadened horizons and renewed enthusiasm for collaborative research and future careers in clinical academia. Check #CATAC2018 on Twitter to see what attendees thought on the day. Find the winning talks from CATAC 2018 here. This competition is for researchers with clinical qualifications who have passed their PhD viva (at the abstract submission closing date). If selected you will be asked to prepare a 10 minute oral presentation, to be followed by 5 minutes of questions from the audience. A panel of judges will score the presentations and there will be 1 winner, who will get £2500, and 1 runner up, who will get £750. This competition is for researchers with clinical qualifications who have not yet passed a PhD viva (at the abstract submission closing date). If selected you will be asked to prepare a 5 minute oral presentation, to be followed by 2 minutes of questions from the audience. A panel of judges will score the presentations and there will be 1 winner, who will get £1500, and 1 runner up, who will get £500. This competition is for all researchers with clinical qualifications, if selected you will be asked to prepare a poster to present at the conference. The posters are grouped by broad research categories and there is a 1 hour session at the conference for two judges, the competitors in that category and other attendees to visit each poster together. You will have 2 minutes to present your poster to the group and 1 minute to answer questions. The judges will score each poster in the group and there will be 1 winner, who will get £1000, and 1 runner up, who will get £250, from each group. Our keynote speakers in 2018 were Dr Katherine Sleeman, NIHR Clinician Scientist and Honorary Consultant in palliative medicine at King's College London, speaking about her 'Adventures in academia: from womb to tomb' and Professor Ed Bullmore, Professor of Psychiatry at the University of Cambridge, author of 'The Inflamed Mind: a radical new approach to depression'. You can find videos of the keynote talks along with the winning presentations from CATAC 2018 here. The Abstract booklet, with information on the speakers, is available here. Following feedback from attendees that they would appreciate the event rotating between London and other venues in the UK - we made the decision to move away from London in 2018, with Edinburgh being our first choice, in an effort to attract an even broader range of delegates from wider sections of the UK. Professor Derek Bell, President, Royal College of Physicians Edinburgh. The Spring Meeting has changed, it is now the Clinical Academics in Training Annual Conference (CATAC). Summaries of our most recent Spring Meetings are available here, which include full lists of winners, videos and podcasts. 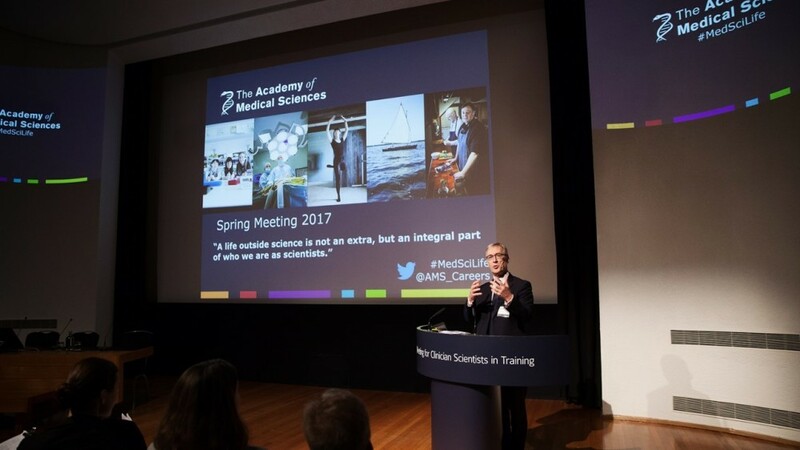 Alternatively, you can view series of videos about Spring Meeting on the Academy's YouTube channel.